Overwhelmed with zucchini from your garden? 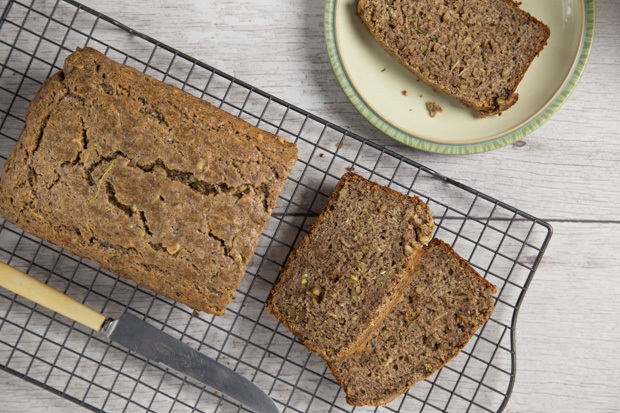 This moist and delicious zucchini bread is the perfect recipe to use it up! Preheat the oven to 325 °F (160 °C). Lightly grease a 9- x 5-inch (22 x 12.5 cm) loaf pan and line the bottom and sides with parchment paper. In a medium bowl, stir together the all-purpose flour, flaxseed, whole wheat flour, baking powder, baking soda, salt and spices. In a bowl of a stand mixer fitted with the paddle attachment, beat the butter and sugar until creamy. Beat in the eggs one at a time, then add the yogurt and vanilla. Beat well. Stir in the grated zucchini. Stir the flour mixture into the wet ingredients, along with the buttermilk. Fold in the chopped nuts. Scrape the batter into the prepared loaf pan. Bake for 70-80 minutes, until the middle is set and a toothpick inserted in the centre come out with just a few crumbs clinging to it. Cool in the pan for 10 minutes, then remove from the loaf pan. Cool completely on a wire rack before slicing. The loaf keeps well, wrapped in plastic wrap, for up to 4 days. Yield: 1 loaf (8-10 slices). Serving Size: 1 slices. Each serving contains 1 Tbsp (15 mL) of flax.